Today Lal Kitab needs no formal introduction as it has become immensely popular among astrologers and masses equally. Pt. Roop Chand Joshi of Pharwala in Punjab was the originator of this system of astrology. 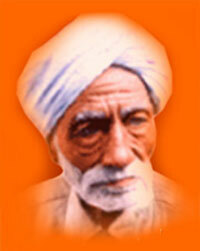 He wrote Lal Kitab in a series of five books in Urdu which was later on translated into Hindi by Pt. Beni Madhav Goswami Ji. 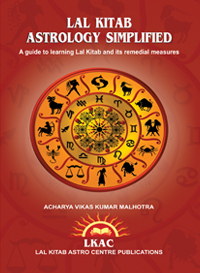 The uniqueness of Lal Kitab lies in combination of features of astrology and palmistry. A good knowledge of palmistry can help an astrologer in interpreting horoscope more accurately. All the remedies of Lal Kitab are scientific in nature and although its basic principles are same as in Vedic astrology but the concepts like artificial planets, blind planets, sleeping houses or planets, scapegoat planets make the system different from traditional astrology. The most significant contribution of Lal Kitab is that it shows that a planet can be moved to another house subject to certain conditions through following suitable remedial measures. In the coming time period, it is expected that Lal Kitab remedies would gain more popularity and will help the people in bringing positive change in their life because these remedies are simple to do and are very effective in bringing desired changes in life. DO LAFZI SE ZEHMAT HATA DETI HAI"
Truly Lal Kitab is a unique book of astrology which has the ability to activate your fortune through simple and easy remedies. I would not discuss here the origin of Lal Kitab and description of five books of Lal Kitab as they are dealt with earlier by me in my earlier articles and posts. You can visit our website or social media pages to read about how Lal Kitab originated, its basic concept, five editions of Lal Kitab written by Pandit Roop Chand Joshi Ji. In this post, I am discussing the unique features of Lal Kitab which are different from Vedic astrology. These unique features are the pillars of strengths of Lal Kitab. Understanding of Lal Kitab principles in the right manner may enable a practitioner to recommend simple and easy remedies for various planetary combinations and thus clients would be able to get the advantage of this wonderful book of astrology. Vedic and other branches of astrology generally suggest very few remedial measures which are complicated and expensive, whereas in Lal Kitab simple remedial Measures are suggested based on the position of every planet. Lal Kitab is a book which is based on Palmistry and thus a sound knowledge of Palmistry is an added advantage for the Lal Kitab practitioner. Palmistry helps a lot in rectifying horoscope known as “Durusti” of horoscope. It is important to mention here that there is a misconception even among the practitioners of Lal Kitab that is it is a book of remedial measures only. It is not a book of Totka as is perceived and communicated by many practitioners of Vedic astrology and general public also. Lal Kitab is based on certain scientific principles & remedies are suggested looking at the planet which can be rectified or which is exhibiting doubtful nature. The results of planet which is in its permanent house or a planet which is of Grah Phal cannot be changed and in such cases remedies for other planets have to be undertaken. Lal Kitab has a considerable part that is devoted to discussing its grammar so that appropriate remedial measures can be suggested. There are many practitioners in the market who recommend Lal Kitab remedies for nine planets looking at their position in the horoscope or varshphal but this is a wrong practice. A good Lal Kitab practitioner goes to the root cause of problem for the native and then a remedy is suggested for the planet which can be rectified through Lal Kitab remedies. Today many practitioners of Vedic astrology have combined their astrology with the remedies suggested by Lal Kitab. They give predictions according to their own theories and suggest remedial measures of Lal Kitab which is not the correct way. Good or Bad planet suggested by the other astrological theories may differ from the theory of Lal Kitab Astrology because it has different system of judging good or bad planets, so the remedial measures suggested will not give desired results or may be ineffective. Many astrologers have quoted that the messages given in the Lal Kitab are written in a hay way manner and also are irrelevant, but nobody has tried to solve the mystic messages of Lal Kitab by analysis of such messages systematically. Such mystic messages in Lal Kitab do have specific meanings which cannot be understood without its deep study & application to practical horoscopes. Lal Kitab is unique because the remedies suggested by it are very simple and can be performed easily. It does not require the practice of any hard remedies, Yagnas, Havanas and other costly and impossible affairs. The most important aspect of Lal Kitab is that it suggests every individual to live a life without hatred and ill feelings towards others. It suggests an individual to maintain his relations and have good conduct to get the best of his or her planet results. 3. Multiple planets that are together in the birth chart in a particular house, remain grouped together for the rest of an individual life. While preparing the annual horoscope, these planets move together as a group. For example, if a native has Jupiter, Sun and Saturn together in the first house in the birth chart, these planets will move together to the fourth house in 25th year of native life. You can refer to annual horoscope or varshphal tables for this purpose. 4. In order to judge a horoscope, one need not consider the Nakshatra (constellation) or Rashi. Also Lal Kitab does not consider the effect of transition of planets (gochar) thus eliminating the need for an almanac. The only time one needs an almanac is, when one is preparing the natal birth chart. After that, an almanac is not needed at all, ever. “He” disregarded the constellations and the birth sign and got rid of the almanac or panchang. “He” fixed Aries as the sign in the first house and similarly the twelve signs in the twelve houses of the horoscope. 5. All the things around us have been fixed as representatives of, or belonging to, the nine planets. Relatives, professions, things placed in a dwelling including cattle, pets, trees, plants etc. establish good or evil effect of a planet. 6. The need for Navmansha and other charts, such as Saptamsha etc. have been completely eliminated from Lal Kitab consideration. Only the basic natal chart is required. Lal Kitab has its own way of making the Chandra Kundli, which is looked at in special circumstances. 7. Lal Kitab neither has Vimshottari Maha dashaa, nor the Sade Sati consideration of Saturn. It does, however, have its own planetary cycle of thirty-five years. 8. Mangalik dosh has been eliminated from consideration. However, since Mars has been assigned two mounts on the hand (Upper and Lower mounts). Lal Kitab considers Mars as giving dual effect – good and bad. 9. Malefic effect of planets can be of two types: Graha Phal and Rashi Phal. An Upaya can be utilized to guard against the Rashi Phal effect. Graha Phal cannot be altered by ordinary mortal beings. It is the Rashi Phal effect that can be modified using the upayas. 10. Lal Kitab system neither prescribes nor prohibits fasts. 12. Lal Kitab system cannot be used to harm others. There is no provision in it to do that. This system attempts to defend one against evil planetary effects. 13. Lal Kitab system is secular in nature. In order to perform an upaya, one can go to a religious place of individual choice, which could be a temple, a gurudwara or, a mosque or church. mentioned.) These upayas can be performed by native blood relatives. 15. As stated before, this system does not consider itself superior to other prevalent systems of astrology. "कर भला होगा भला, आखिर भले का भला"